Pickup beds are getting taller and taller and it has gotten harder and harder to reach into the bed of the truck. If you're nodding your head right now, you'll love the BedStep 2 Truck Bed Side Step by AMP Research! This simple and effective step allows you to access your pickup bed FROM THE SIDE OF THE TRUCK safely, securely and conveniently, no matter what you�re hauling. 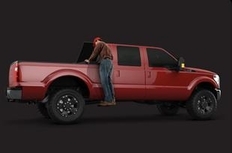 Its ingenious frame mounting gives you easy access to the front of your truck bed. The AMP Research BedStep 2 is designed to hide under your truck when driving, for improved aerodynamics, ground clearance, and good looks. Then, when you need it, it flips down with an easy push from your foot, extending out and back to give you a solid, secure step. It hides away just as easily. Installation is fast and easy and does not require any drilling! Expect to spend about 30 minutes installing your new BedStep 2 Truck Bed Side Step.